Palampur is a beautiful tourist destination placed 1,220 metres high in the northwestern region of Himachal Pradesh. Blessed with deodar forests, pine trees and stunning tea gardens, colonial architecture and temples, Palampur combines enchanting backdrops with rich water sources to form an incredible tourist destination. The hill station derived its name from Pilum that translates to "abundant water". 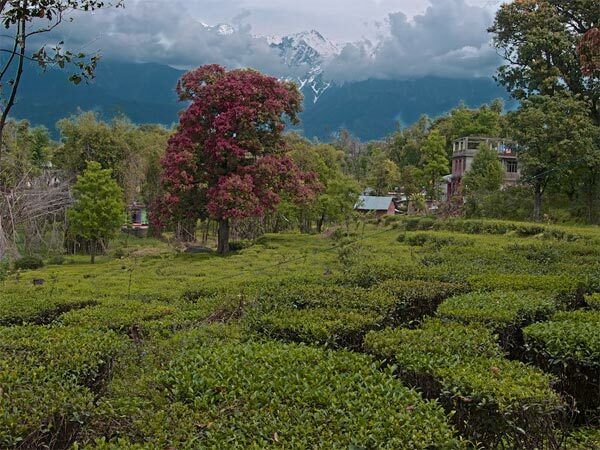 Palampur is quite famous among locals and tourists alike for its fascinating tea plantations. Victorian style mansions and castles decorate the streets of Palampur. Palampur is often fondly referred as the tea capital of northern India. A preferable mode of transport to commute from the capital city, Delhi, to Palampur is by car. The distance spans around 12-14 hours and covers an average range of 489 kilometres. Palampur experiences a mild, pleasant climate all through the year. The temperatures during summers hover around 30 degrees Celsius. There is slight rainfall during the monsoon season and the winter season is a bit chilly with temperatures going below zero degrees Celsius. The months between March to June and during the months of mid-September to November are considered to be the best times to visit Palampur. By Bus: Several bus services are frequently running on this route. Tourists and visitors can choose among A/C sleeper, Non-A/C Sleeper, Volvo A/C and Non-A/C Airbus. By Train: The Palampur Himachal is the nearest railway station to Palampur. The train journey lasts approximately 8 hours. By Car: This is the most preferred mode of transport for the tourists and visitors travelling from Delhi. The journey lasts for approximately 14 hours. By Flight: The nearest airport from Palampur is Dharamshala and Kangra that are 36 km and 26 km away from Palampur respectively. The flight journey lasts for about 1 hour. If you travel via flight, then you need to break down either at Dharamshala or Kangra and go the remaining distance via a cab or a bus. The total journey time would be around 4 hours. Alternatively, you can lengthen your journey by taking flights to Kullu, Chandigarh, Amritsar and travel the remaining distance via a cab or a bus. The total trip would be extended by 4-5 hours, but you would get to access several mind-blowing destinations and attractions all through your journey, making the overall experience totally worth it. If you are willing to take a train, then you can stop over at Jalandhar, Pathankot, Una, Gurdaspur, Phagwara, Anandpur Sahib, Ropar, Manali, Ludhiana, Amritsar, Jammu, Udhampur, Kalka and Chandigarh. You can catch a connecting bus or a cab to cover the remaining distance till Palampur. The train journey would last around 15-18 hours depending on your stopover. If you wish to travel via bus, then apart from above railway stopovers, you can stop at Dalhousie, Shimla, Rampur and Katra. The bus journey should last around 15-18 hours. Palampur features several mind-blowing attractions like the Tashi Jong Monastery, Dhauladhar National Park, Chamunda Devi, Neugal Khad, Saurabh Van Vihar, Tea Gardens, Baijnath Shiva Temple, Church of St. John, Kangra Fort, Pottery in Andretta, Norbulingka Institute, Naam Art Gallery and much more. Alternatively, you can also stroll down the streets and admire the beautiful colonial architecture build during the British rule. There are several getaways around Palampur for relaxing your body, mind and soul. The Andretta village is just 13 kilometres away from Palampur and is considered to be a craft centre in North India, especially for pottery. The Gopalpur town houses a mini zoo at a distance of 13 kilometres. The Baijnath town is around 16 kilometres from Palampur and is famous for the Shiva temple. You can visit Sujanpur Tira, 42 kilometres away, blessed with numerous ancient forts and temples. Bhuntar is a popular getaway from Palampur and has a significant and rich historical and religious background. Dalhousie is a popular getaway from Palampur and is one of the prominent tourist spots in the region. It is blessed with incredible beauty and built over five hills namely, Portreyn, Bakrota, Kathlog, Balun and Tehra. Kullu is also one of the popular religious destinations that comes with abundant natural beauty. Kullu has featured in many great Indian epics like the Mahabharata, the Ramayana and the Vishnu Purana. There are plenty of other popular spots in the state of Himachal Pradesh that are vying for the attention of tourists and visitors. All situated within the range of 300 kilometres from Palampur. Several trek routes help you discover the best of Palampur. Some of the favourite trails include the Baijnath to Jalsu Pass to Bharmour, Dhauladhar, Sanghar Pass to Bharmour via Holi. You must keep minimum 4-5 days for covering these treks. At a short distance of 28 kilometres from Palampur, there are excellent adventures sports facilities for hang gliding and paragliding. There are also several Buddhist monuments that house famous Tibetan handicrafts.